Just weeks after her whirlwind romance with Tom Hiddleston began on the shores of Rhode Island, Taylor Swift has finally completed her goal of meeting everyone in England. 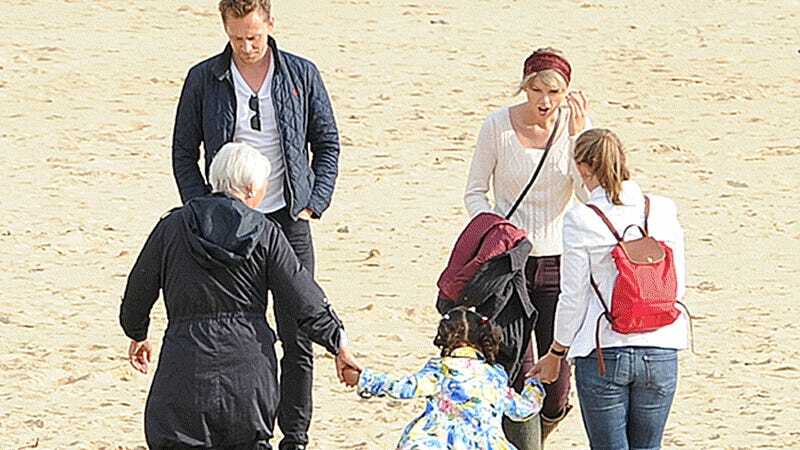 Though she made quite a dent through her ongoing friendship with Ed Sheeran and former relationships with Harry Styles and even Scotsman Adam “Calvin Harris” Wiles (who introduced her to all his English friends), it wasn’t until this past weekend that Swift met the only remaining people in the country: Tom Hiddleston’s family. The 35-year-old Night Manager star introduced the 26-year-old singer to his mom Diana on Friday, while visiting her hometown of Suffolk on the east coast of England. In photos of the meeting, the trio looked happy, walking arm-in-arm together down the street near Diana’s home in the town of Ipswich. They were all smiles on the sunny day, Swift dressed in a chic black jumpsuit and black flats and the Hiddlestons both in jeans and blue tops. Congrats on crossing that item off your bucket list, Taylor! I wonder what country she’ll conquer next. It’s sort of funny to talk about your adult love life as the fulfillment of your childhood fantasies, but whatever!